The former Dallas County Courthouse in Dallas. 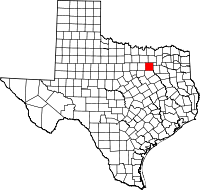 County Dallas adalah county yang terletak di negara bagian Texas, Amerika Serikat. Jumlah penduduk pada tahun 2010 sebesar 2.368.139 jiwa. History of Dallas County, Texas: from 1837 to 1887 by John Henry Brown, published 1887, hosted by the Portal to Texas History. Memorial and biographical history of Dallas County, Texas published 1892, hosted by the Portal to Texas History. Official directory, taxpayers of Dallas County, Texas published 1896, hosted by the Portal to Texas History. Halaman ini terakhir diubah pada 27 Oktober 2016, pukul 08.01.